There’s a pretty familiar runner joke: “How can you tell if someone has run a marathon? Oh, don’t worry, they’ll tell you.” It’s true because runners work hard to train for those endurance tests and they want to share that with other people. 26.2 miles is no easy feat. They’ve put in so much time training their body to be ready for performance. Isn’t that what we also do as singers? We train our brains, voices, and bodies to get ready for performances. We put in countless hours picking music for the program, studying the score, and scheduling a venue. Therefore, we must develop an audience and communicate with them regularly to make sure our labors do not go to waste. Having a plan for developing ourselves as musicians and developing our audiences is going to be make that process easier. Great businesses, no matter their size, work hard to create a superior product or service; but, they also make sure they are reaching the right audience for it too. Audience development is more than just “build it and they will come.” For this exercise we are going to cultivate a following for your specific talent. Have you ever heard a voice teacher or master class presenter recommend keeping a practice journal? I realize the superb benefits of such a journal but sometimes it seems so difficult to keep it together. That all changed for me, however, when I started thinking about crafting a content plan for singing and connecting with my supporters. Bloggers often create content plans to help them post consistently on topic. So, we’ll borrow a page from that textbook and work out our own singing content plan. In fact, I fell head-over-vertiginous heels for these free printable blog planners from Jenni at A Well Crafted Party. We can use them as an outline for creating our own plan. Doesn’t it feel like you need 8 days in a week to get to everything you want to do? Once you start planning ahead what you’ll do with the time you have available for practicing, you can become more efficient. Plus, you may plan what you need to cover and realize you need to make more time in your schedule to sufficiently prepare for your performance. That’s why I really enjoy Jenni’s “Weekly Blog Planner” for our purposes. It leaves enough space to write what you need to accomplish each day of the week. I imagine all you wonderful divas sitting down with your Sunday morning coffee (or evening Malbec?) and making a plan for your week, entering it into your calendars, and finally checking off the little “scheduled” box in the bottom right. Then, you can change the “published” box to “accomplished” and put a triumphant check mark there at the end of your practice session. The social media icons are a good reminder to keep sharing consistently with your fans. This is a big part of the audience development aspect. You could even add another box for your occasional eblasts so that they aren’t an afterthought but something you plan ahead. If a recital happens in a forest… which is to say, remember to use your social media to its greatest power and connect with your main fan base. If something interesting occurs, and no one tweets about it, did it really happen? Jenni’s planner includes: backup blog, comment replies, check design, and check links. To reframe this for our singing content plan, think of this checklist for your singerly things that need regular updating. You could easily add things like update repertoire list, check website calendar, reply to singing emails, look through YAPtracker, and check sound files. What other weekly tasks would you add to this category? If I’m gearing up for audition season again, I might include aria package run-through/review here. Maintenance is musical, physical, and digital when it comes to the diva life. This is different from the social media connection above. This checklist serves as a list of the people you are meeting with to drive your singing business. Have a lesson? Have a coaching? Meeting a conductor or presenter for coffee? Put those face-to-face business meetings here. Include the repertoire that you will bring and a goal for the meeting and you are reaching super-planner diva status. The only way to move forward is to look in that direction. Go back to your dream list and pick up those goals that you want to accomplish this quarter. Insert them into the plan and (it will seem like magic at first) you will be crossing them off the to-do list in no time. How will you continue to develop your audience next week? Write it down and commit to making it happen. It’s time to make some noise. I would love to hear that runners joke re-purposed as such, “How do you know if someone’s an opera singer? Oh don’t worry, they’ve already invited you to their show and convinced you to bring ten friends.” That would sure make people sit up and take notice. Sometimes singers shy away from talking about their upcoming gigs. Maybe they feel like they’re crowing? Talk about your passions. People dig that! Finally, having a content plan for bettering yourself as a musician and developing your audience is going to make you feel more in control of your diva life. Do you already use a content plan in this way? I would love to hear about how you make it work. Share your experiences with me in the comments below. I can’t wait to hear about it. Or, if you would like to share your super-planner diva status with the twitterverse, hit me up at @mezzoihnen. Divas, we only have a couple of days left in my favorite month of the year. 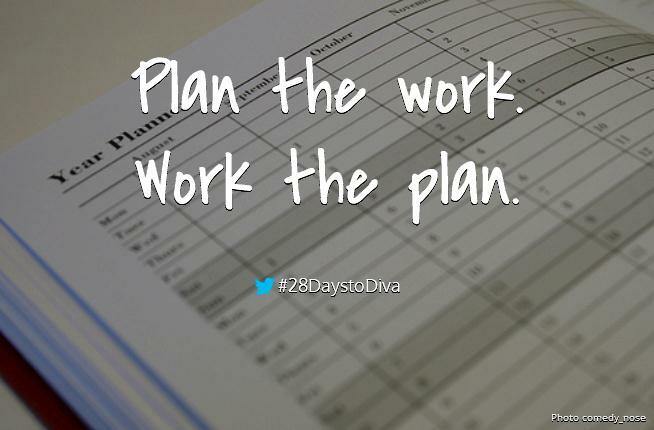 I hope you’ll join me for the last posts of this year’s 28 Days to Diva! You made a usually very slow and sluggish month incredibly productive for me. Looking forward to the last two. Jenni! You are so quick. I was gonna send you a note. Thank you, thank you, thank you for creating those printables. I look forward to seeing the updated versions!